China.Com, one of the most influential Network Media in China published an announcement of the first Vertical Forest social housing project which will be built in Eindhoven. 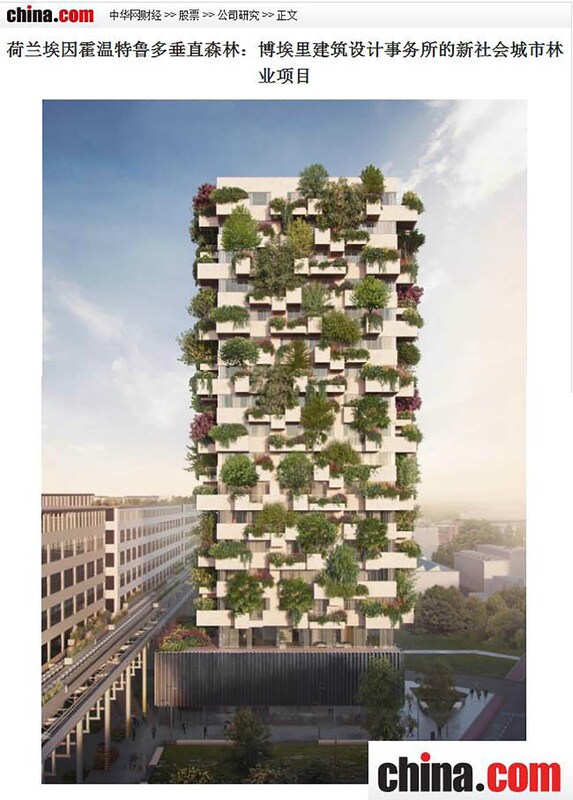 Recent years, Stefano Boeri Architetti used every opportunity to create green buildings and open up new perspectives to urban forestry, improving the Milanese prototype of Vertical Forest in all over the world. The Trudo Vertical Forest is a small-big step forward in the research on architecture inhabited by trees while improving the living conditions of low-income social groups. Following Milan, Lausanne, Nanjing, Paris, Shanghai, Utrecht and Liuzhou Forest City, it is now the turn of Eindhoven, the latest piece to be added to the great Urban Forestry campaign launched by Stefano Boeri Architetti.